This is my character sheet, or design specification, for the apostle Simon the Zealot, which is a different person to Philip the Evangelist. The purpose of this sheet is to keep a record of the attributes or characteristics of my drawing, so that I can draw a similar-looking cartoon in all future scenes including Simon the Zealot. I first drew my version of Simon the Zealot in March 2009, very early on in the history of Bible Cartoons. Those early pictures were for stories found in John’s gospel. By formalising my ideas on a character design sheet in this way I would have a simple and accessible design reference point, which would remind me of what I had drawn in previous cartoons. 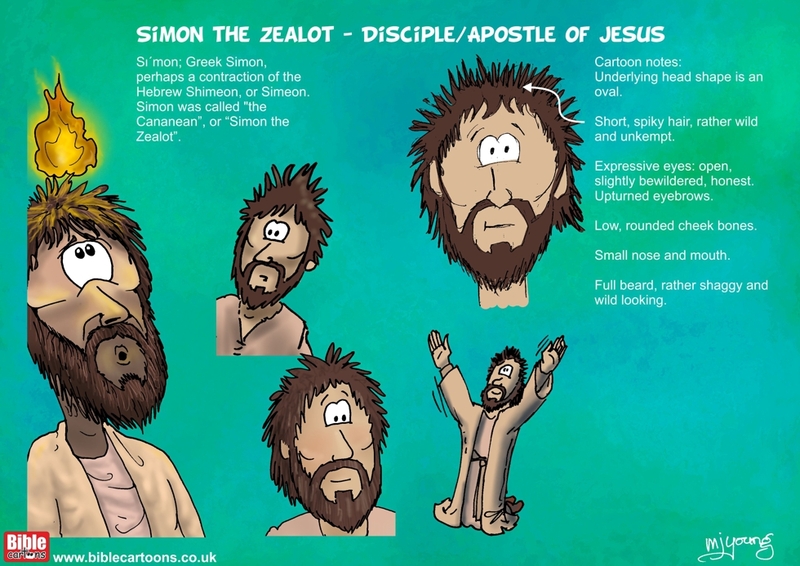 By referring to this sheet every time I drew a scene including Simon the Zealot I hoped I would be able to draw and colour him to match previous cartoons, ensuring great similarity and therefore continuity between Bible Cartoons featuring Simon the Zealot, even if these cartoons were drawn months or even years apart. Without this character sheet to refer to I might very well accidentally draw a scene where the Simon the Zealot character is quite different from previous drawings, which would be a problem if someone views and/or buys several Bible Cartoons and the same person looks quite different in each scene! There is a very real danger of this happening since my abilities and style gradually change and evolve over time, especially as I learn new art techniques and want to incorporate new ideas into my Bible Cartons. By referring to the character sheet I can be confident that I will draw a similar-looking person, even if my artistic skills have undergone change and development over time. Sι´mon; Greek Simon, perhaps a contraction of the Hebrew Shimeon, or Simeon. Simon “the Cananean”, or “Simon the Zealot” was one of the twelve apostles (Matthew 10:4; Mark 3:18; Luke 6:15; Acts 1:13). The latter term (Gk. Zelotes), which is peculiar to Luke, is the Gk. equivalent for the Aram. term Qanne’an. The Zealots were a faction, headed by Judas of Galilee, who “in the days of the enrollment” (compare Acts 5:37; Luke 2:1-2) bitterly opposed the threatened increase of taxation at the census of Quirinius, and would have hastened by the sword the fulfillment of Messianic prophecy. Simon the Zealot is not to be identified with Simon, the brother of Jesus.